Pictured above is a snowy grouper. All photos taken by Author Chris Paparo. 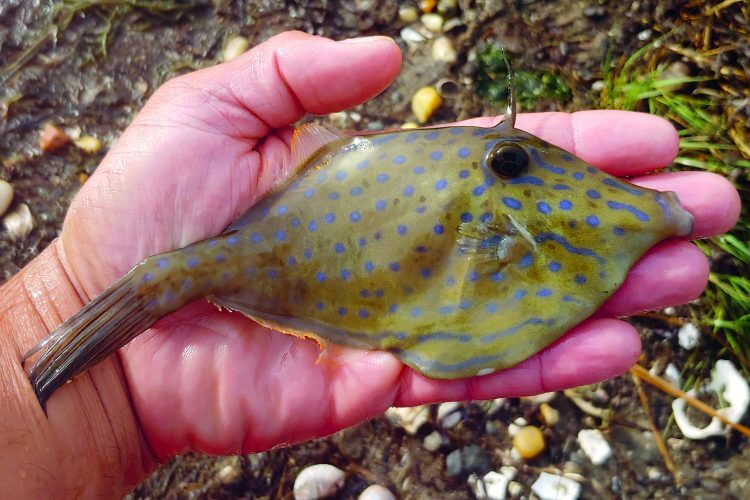 Every summer, exotic tropical fish make their way into weekly fishing reports in the Northeast. 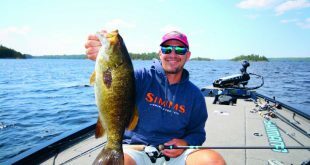 Some of these catches are small “aquarium” fish, while others are gamefish that southern anglers take for granted. Thanks to the Gulf Stream, we see some spectacular catches that would usually require traveling great distances to experience. The Gulf Stream is a powerful “river” that flows northward along the east coast of Florida, turning northeast off the coast of the Carolinas, and continuing past Long Island and Cape Cod (roughly 100 miles offshore) before it heads out across the Atlantic Ocean. The warm tropical waters it transports have a major impact on the weather patterns of the Northeast – and Europe as well. To a fisherman like me, the Gulf Stream plays an even more important role. It carries a wide variety of tropical organisms within easy reach of my fishing pole or collection net. These tropical visitors arrive in one of two ways: on their own power or completely at the mercy of the currents. Those that swim here on their own typically do so as adults, following the warm waters of the Gulf Stream as they search for food. The most common of these fish is the gray triggerfish. Arriving by early July, offshore anglers encounter schools of these fish seeking shelter under pieces of flotsam. As they move inshore, they take up residence along buoy chains, jetties and wrecks. 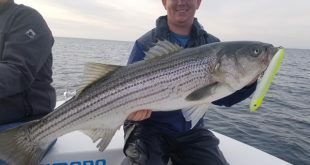 Other tropical species I have encountered or seen pictures of from reliable sources include tarpon up to 5 feet inside Peconic Bay, a 4-foot-long barracuda at Montauk Point, a 70-pound cubera snapper caught off Point Judith, and a sailfish in the Cape Cod Canal. These fish, along with the rays, triggerfish, and other tropical species, leave our area when water temperatures begin to drop in the fall. The second group of tropical visitors to the Northeast have no say in their journey. They arrive on the Gulf Stream, but do not swim here on their own power; instead, they are carried by the current. For many marine organisms, spawning consists of releasing eggs and sperm into the water and leaving it to chance that they will combine to create a fertilized egg. The fertilized egg develops into a larva and is at the mercy of the currents until it metamorphoses and settles as a juvenile. 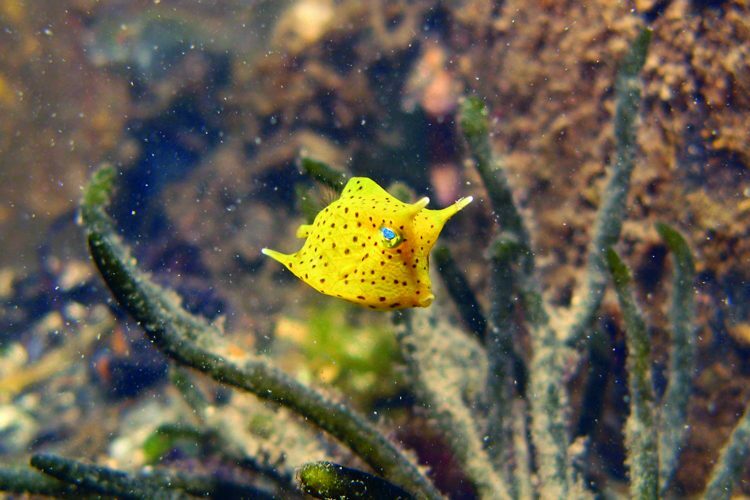 This larval stage can last for several months, Although not as common as spotfins, foureye, banded, and reef butterflyfish can also be in the mix. 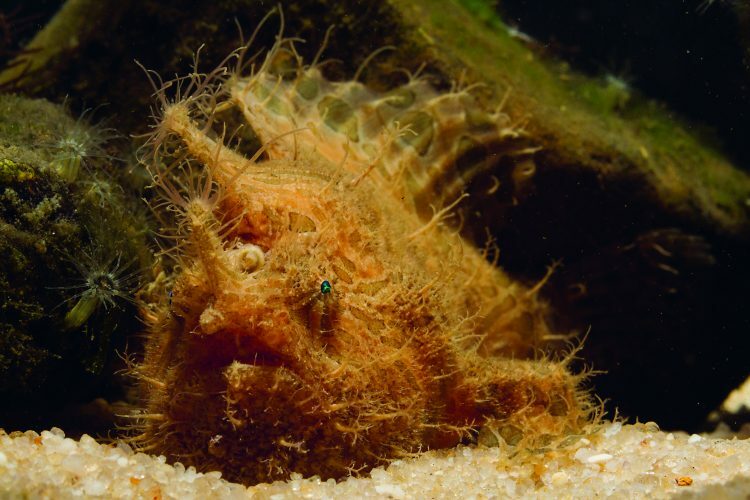 There are many other reef species that can be found in the dark waters of the Northeast. They include angelfish (blue, French, grey), damselfish (bi-colored, coco, beaugregory), surgeonfish (ocean surgeon, doctorfish, blue tang), filefish (planehead, orange, scrawled, dotterel, slender), groupers (gag, scamp, red, black, snowy), snapper (grey, mutton), goatfish (dwarf, red), cowfish, trunkfish, squirrelfish, short big eyes, glass eye snappers, blue-spotted cornetfish, peppermint shrimp, brown shrimp, and shamefaced and during this time, ocean currents may carry it far from where it was originally fertilized. Some of these larval organisms are picked up by the Gulf Stream and carried northward every summer. 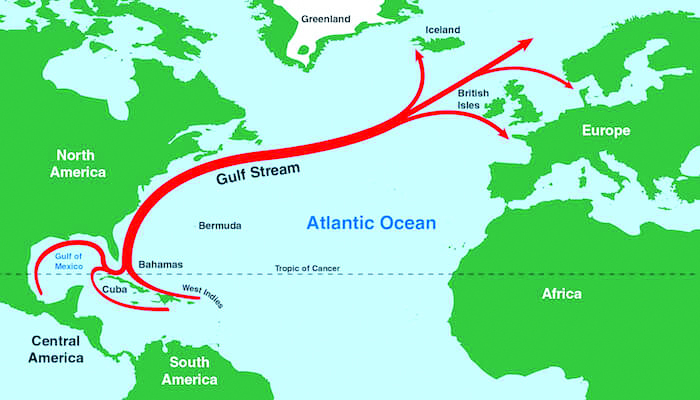 The Gulf Stream carries warm water up the eastern coast of the United States, bringing with it a host of southern hitchhikers. 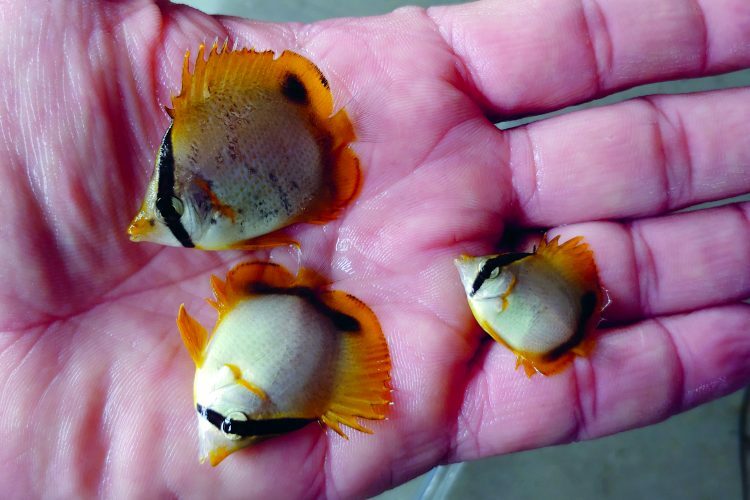 Of all the larval drifters, the spotfin butterflyfish is one of the most abundant. I recall days when pulling a 25-foot minnow seine for 50 yards in 4 feet of water yielded well over 100 dime- and quarter-sized butterflyfish. Although not as common as spotfins, foureye, banded, and reef butterflyfish can also be in the mix. 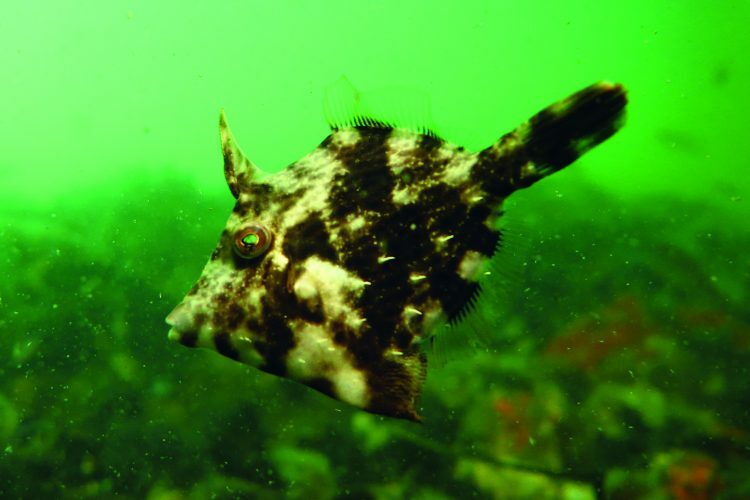 There are many other reef species that can be found in the dark waters of the Northeast. They include angelfish (blue, French, grey), damselfish (bi-colored, coco, beaugregory), surgeonfish (ocean surgeon, doctorfish, blue tang), filefish (planehead, orange, scrawled, dotterel, slender), groupers (gag, scamp, red, black, snowy), snapper (grey, mutton), goatfish (dwarf, red), cowfish, trunkfish, squirrelfish, short big eyes, glass eye snappers, blue spotted cornetfish, peppermint shrimp, brown shrimp, and shamefaced crabs, among many others. And, not just “aquarium” fish/invertebrates ride the Gulf Stream to the Northeast. 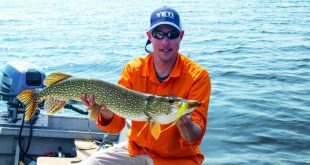 Many jack species, some of which are highly sought after by anglers, also go along for the ride. Crevalle jacks, horse-eye jacks, yellow jacks, permit, pompano, African pompano, banded rudderfish, blue runner, moonfish, and lookdowns can all be commonly found during the summer and fall months. 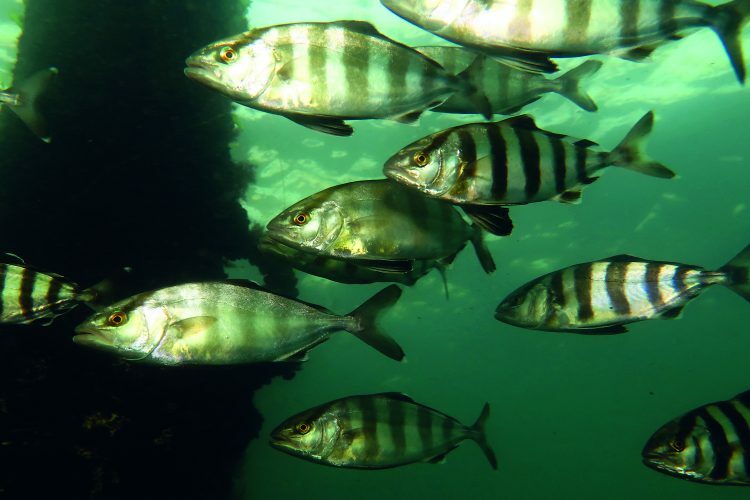 Most of these fish are easily recognizable as adults, but as young-of-year fish, identifying them can be quite difficult. 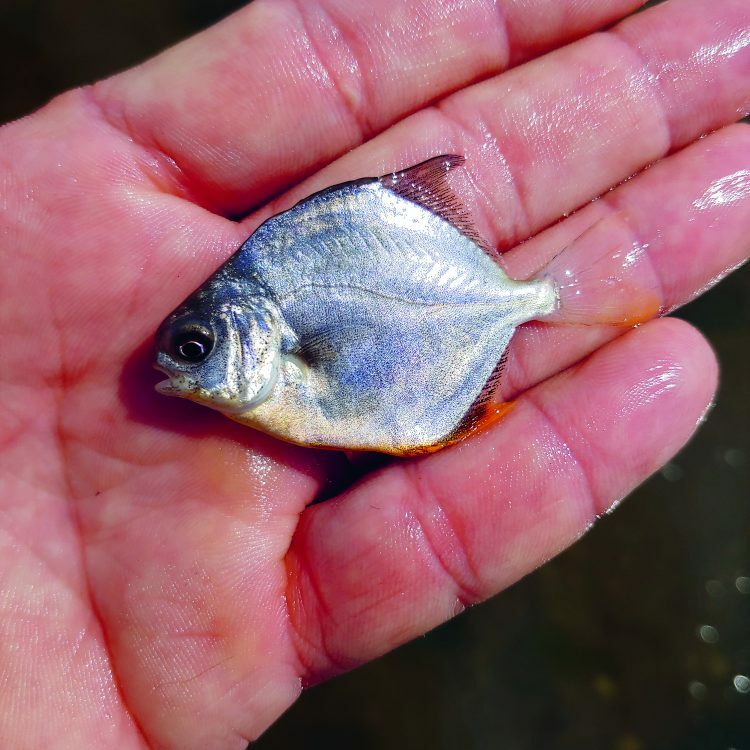 A quarter-sized African pompano has many 8-to10-inch-long streamer dorsal and ventral fins. Adult crevalle jacks are normally silver in color, but when only a couple inches in length, they are yellow with many small bars. What happens to all these drifters when water temperatures begin to drop? 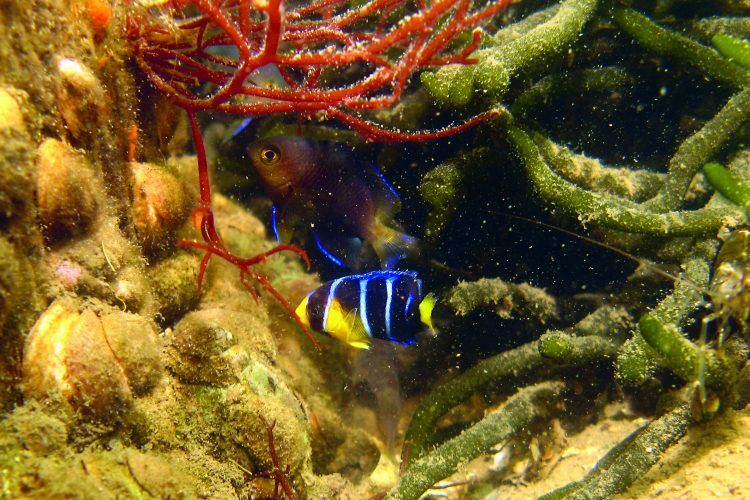 While in their native range, those fish/invertebrates with a connection to coral reefs (butterflyfish, surgeonfish, angelfish, etc.) typically migrate vertically as the seasons change, but do not usually migrate great distances. As the local waters begin to chill, these fish do not have the ability or instinct to leave, and will perish with the onset of winter. On the other hand, open water species (i.e., jacks) spend their entire lives traveling great distances and then school up and leave before winter sets in. 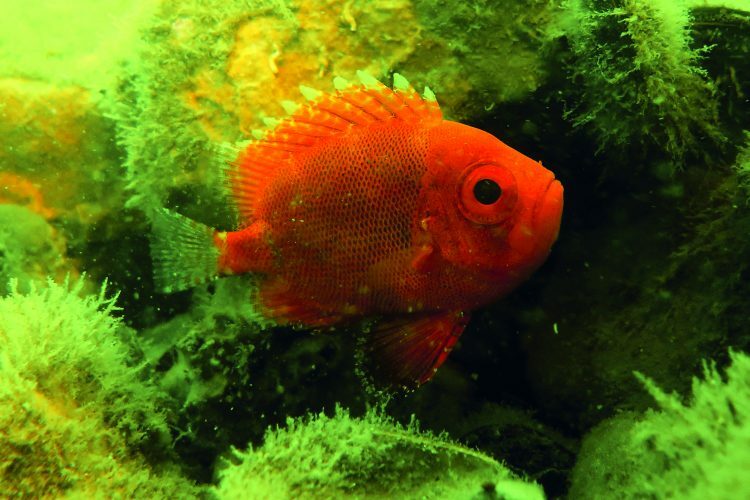 In the past, I always assumed that groupers perished along with other reef fish/invertebrates. However, some believe they might not succumb to the cold after all. While diving along the rock walls of inlets during October, I observed large numbers of groupers up to 8 inches long that were not in these areas earlier in the summer. It is possible that these fish, which are closely related to black sea bass, are leaving the bay before winter arrives. Additionally, adult snowy groupers have been found at depths greater than 1,000 feet where the water temperatures are always cold. 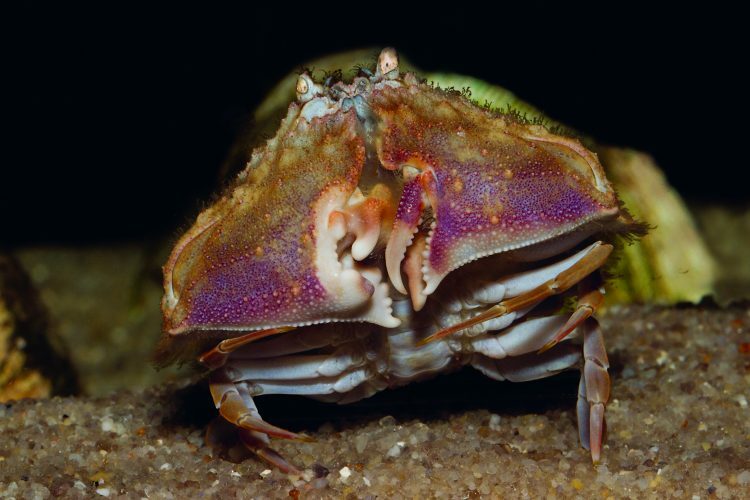 The diversity of tropical organisms found in our waters can vary greatly year to year. 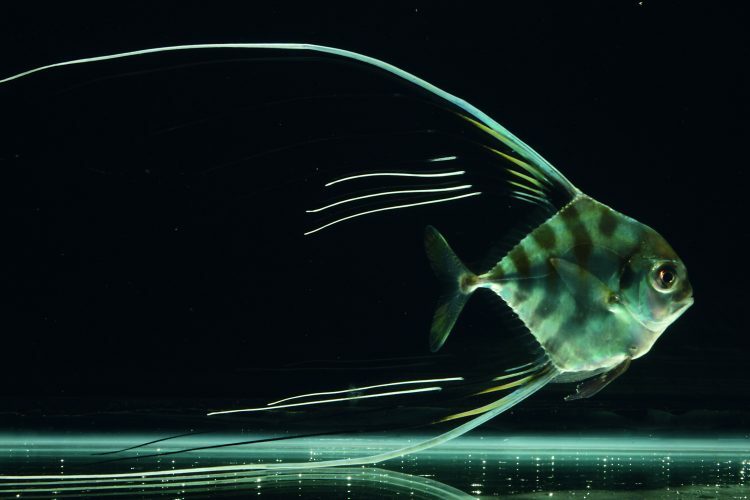 Factors such as variations in population abundance, timing of spawns and, most importantly, the flow of the Gulf Stream affects what fish are carried to our area. One summer, we will see a plethora of a particular species, and they will be absent the following year. In my approximately thirty years of collecting fish, my records show that 2016 and 2017 were by far the worst. 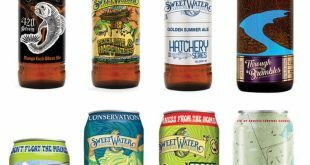 During those two summers, the predominate summer winds blew from the southwest. This pushed coastal water along our shores and very few, if any, tropical strays were brought inshore. The best years are always those when the winds blow from the south/southeast. This wind pattern pushes eddies that have broken away from the main flow of the Gulf Stream inshore, carrying with them waves of tropical drifters.